This school camp is full of secrets and surprises! 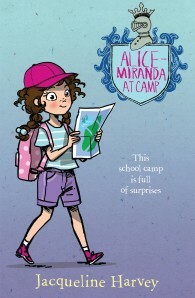 An exciting announcement has been made and Alice-Miranda and her schoolmates are going on camp. There are sleep outs, treasure hunts and so many other activities to look forward to! However, it’s not all fun and games. Alice-Miranda and Millie will need to keep a close eye on Caprice, the school’s newest student, who seems determined to cause trouble. Next door to the camp is Pelham Park, where Alice-Miranda’s father, Hugh, grew up. These days, Hugh’s beautiful old house serves as a retirement home but when some startling objects are uncovered in its cellar, the peaceful estate is turned upside down. With help from a much-loved relative, Alice-Miranda sets out to investigate.